Best Kiosk On Earth And It Has A Brain ! We had to be there ! NOMYU is the digital billboard wich resulted from years of research and development, with innovative tecnhical features and a sophisticated design that result in a supreme product. NOMYU was developed to allow integration of any type of touchscreen technology, thus creating an interactive device for indoor or outdoor. Minimalist and clean lines give an incredibly modern and slim aspect to this digital billboard. This in combination with compact and solid structure, conveys an image of simplicity and robustness. Adaptable to any situation, with a great flexibility of integration and customization of the different components that your project may need. Touch ... the sky ! As the market leader in multimedia kiosks and digital mupis, PARTTEAM GROUP knows that is important to customers a standard design. This is why NOMYU was developed. It is a model that will be immediately identified, although it is possible to configure and customizable in several dimensions, portrait or landscape. A Universe of technology ! The front glass was designed to have a area specifically for placement of a logo or name of the client. Specially developed for dissemination of multimedia advertising and can support displays. Exclusive Wireless system is designed to data transfer with high possibility of distance and external antenna. Developed with ventilation and cooling maximum efficiency and reliability , even in extreme temperatures and temperature variations. The clean lines and right angles corners give it an elegance unprecedented in multimedia kiosks sector. Developed to allow integration of any type of touchscreen technology for indoor or outdoor. Everything needs a brain. 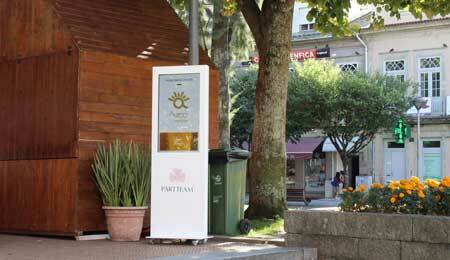 Have you ever seen a kiosk with one? NOMYU is from the future, then it already has it own.